I observed how the orb web spider, Leucauge magnifica, avoided dropping into the water on July 4, 2006 in Nara Prefecture. It was sunny and the temperature was 31℃. 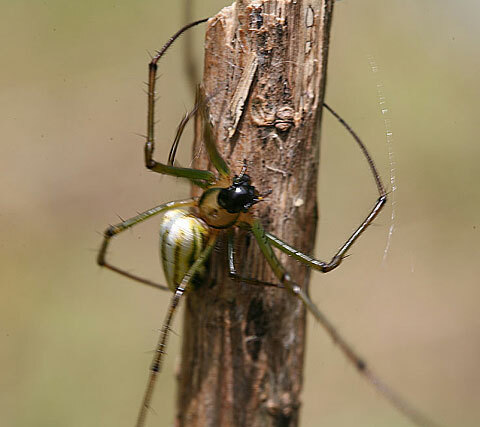 The female Leucauge magnifica (with a length from 14 mm to 15 mm) with its own silk dragline tended to climb up to avoid dropping into the water without touching the water. All the spiders, L. magnifica, were weaving their webs above streams. Then I painted all the eyes of the spider black in enamel paint. The blind spider also tended to climb up to avoid dropping into the water without touching the water. So, perhaps L.magnifica is aware of the surface of the water without its eyes. But, some individuals can be interpreted to recognize the surface of the water with the eyes. The matter needs further investigation. I wish to express my hearty thanks to Dr. Makoto Yoshida for critical reading of the manuscript of this paper.